at the clear blue sky. But not a drop fell in Sweden all summer long that year of 1868. The crops did not grow. There would be no food for winter. "We think of you there in Sweden. - leaving family, friends, and their farm behind. Carl Erik woke up with a start. Please e-mail me with any questions or comments. The sequels are THE LONG WAY WESTWARD. and AT HOME IN A NEW LAND. 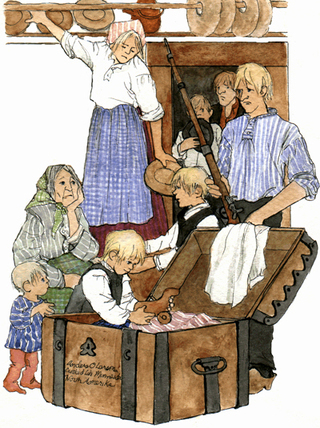 During the "hunger years" of 1868 and '69, more than 50,000 Swedes emigrated to America. Good farmland, jobs, social mobility, religious and political freedom drew them here. Newspapers, pamphlets and letters from earlier emigrants spread the Amerikafeber, or America fever. Like thousands of other European emigrants, Swedes were willing to leave behind everything they knew for the dream of a better life in America, the "Land of Opportunity." Sandin's book depicts one family's journey from a small parched farm in Sweden to Liverpool and, finally, to New York. It is a personalized account - told from one boy's viewpoint - but is typical and therefore broadly informative. The author's own illustrations make a special contribution to both factual and emotive areas, being technically and historically well done as well as sympathetic to their human subjects. The straightforward account clearly describes the hunger, the rough crossing and the confused joy upon arrival that were integral parts of immigrants' experiences... 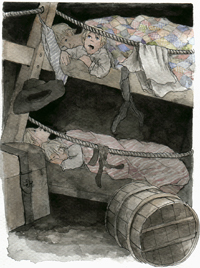 The watercolors are darkish, highlighting faces and essential details for quiet drama. Joan Sandin's look backward in time makes for a good introduction to a subject rarely covered for this age group and reading level. The Long Way to a New Land and The Long Way Westward are companion books that chronicle a family's journey from their Swedish farm, which is suffering from an extended drought, to a new home in Minnesota. 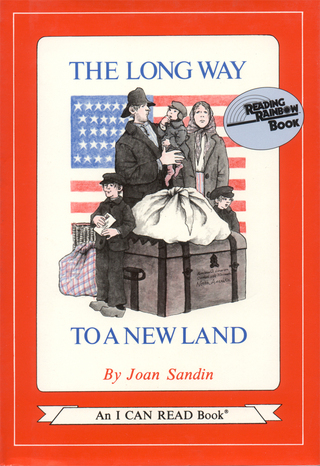 The books describe the difficulty and dangers of the journey in a way that is non-complaining and full of optimism for a new life in America. Teachers, these books are wonderful for integrating with other subjects and topics, such as immigration, westward expansion, steamships, trains, geography, and American life in the 1860s. Except for quoted reviews, all text and art copyright © Joan Sandin. All rights reserved. 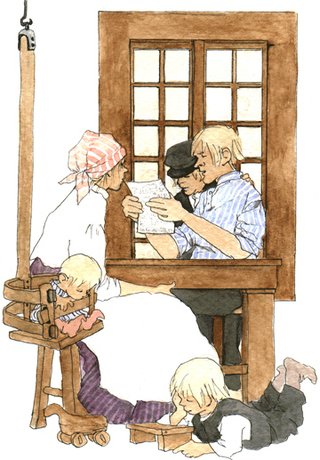 No text or image may be reproduced without the express written consent of the author/illustrator.